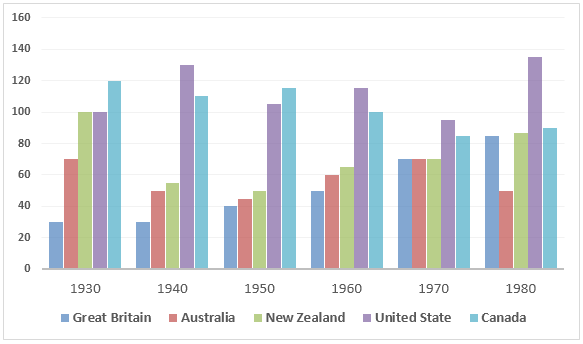 The table chart compares the numbers of prisoners from 1930 to 1980 in five different countries, namely Great Britain, Australia, New Zealand, the United States, and Canada. At a glance at the graph reveals that imprisonment figure in the USA and the UK climbed over the period and in Canada, Australia, New Zealand, it actually declined. It is clearly seen that the United States had the highest number of inmates. Also, Britain had the lowest figure in 4 out of 6 years. This translation is from Laokaoya website. In 1930, the number of prisoners in the United States was the highest, with 120 thousand prisoners, then this number increased significantly to reach a peak of 140 thousand in 1980. By contrast, Britain had the lowest figure of prisoners until 1970, then the figure jumped suddenly to reach 90 thousand. Canada had the highest number of imprisonment in 1930 and 1960 with nearly 140 thousand people each year. In 1970 the number of prisoners in Great Britain, New Zealand and Australia was the same, about 70 thousand people. In 1980, 50 thousands of people in New Zealand were put in prison which was the lowest figure in this year.